I got a few questions about the Electronic View Finder on a mirrorless camera concerning flash photography. And yes, when you use the wrong settings it can be quite a challenge using a mirrorless camera in dark situations when flash is needed. The solution is fairly simple. 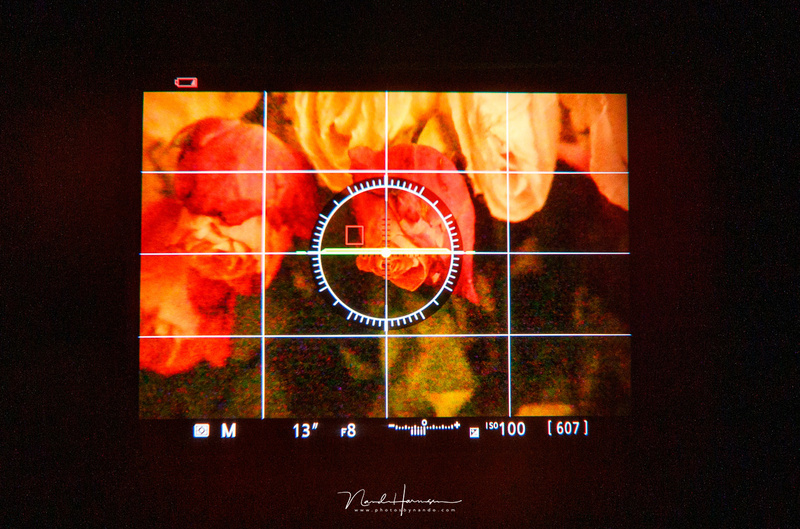 The optical view finder of a DSLR allows us to see through the lens, making the composition as we see fit. 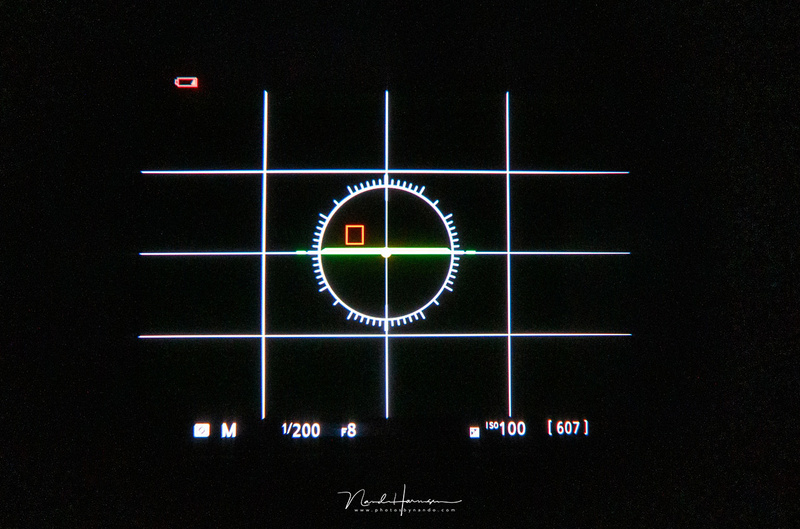 That image in the optical view finder is not influenced by any exposure setting and we have to rely on the exposure meter for the correct exposure. It also means we can see through the optical view finder perfectly when the exposure is completely wrong, or when we rely on flashlight in combination with the flash sync in a dark situation. With mirrorless cameras the Electronic View Finder (EVF) is introduced. A real tiny digital screen that is refreshed in such a high rate it looks (almost) like it is an optical view finder. The beauty of that EVF is the ability to preview the exposure settings of our camera even before the picture is taken, thus having a visible control over how the image will look like when we push the exposure button. It is the similar image we see on the rear screen of the mirrorless camera, and it is also similar to the live view on a DSLR camera. This preview of the exposure setting is called exposure simulation, something that is turned on by default on mirrorless cameras. With exposure simulation we see what the effect of shutterspeed, aperture and ISO has on the image. If the image is underexposed, the EVF will become proportionally darker. This does not happen in an optical viewfinder. 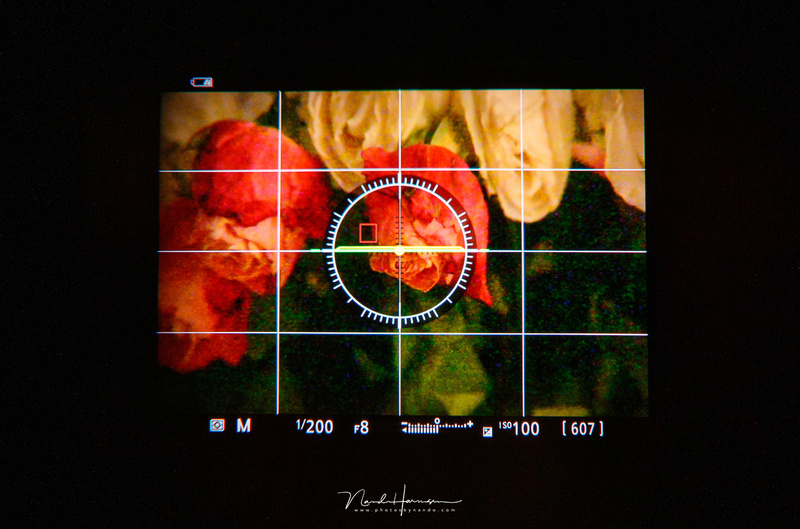 The image shows the EVF of a Nikon Z7 with exposure simulation turned on. For those who use flash photography a lot, it is common to use manual exposure for that. You set the exposure for the amount of ambient light you desire to be visible in the photo, and you use the flashlight for the exposure of the subject itself. When we don’t want the ambient light to register it is best to choose flash sync setting for the shutter time, which is often somewhere between 1/125 and 1/500 of a second. With this exposure setting the ambient light won’t show up and the flash light is the only light that will show up in the photo. And there starts the problem with an EVF. 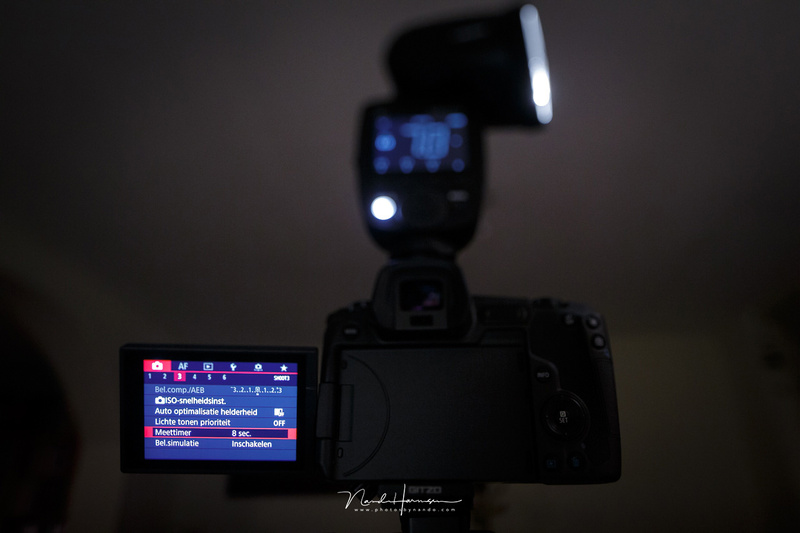 When set to the default setting it will show exposure simulation and since the exposure setting is set on flash sync and not the ambient light, the EFV will show only a dark frame. 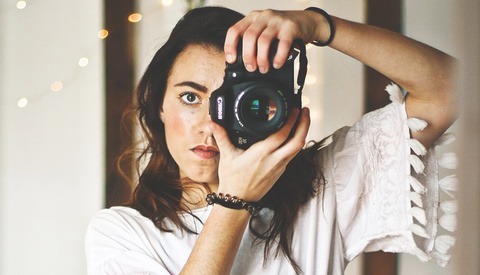 You won’t be able to make the composition anymore, or sometimes even fail to use the auto focus. The solution is very simple, but you have to change a setting in the menu. You need to turn off the exposure simulation of the EVF in order to be able to use it. 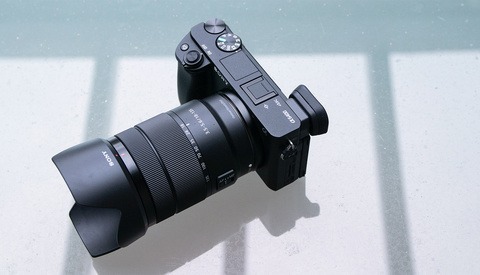 After you have done this, you can use the EVF, or the rear LCD screen again, just like the next two images will show. This also is useful when you use live view on a DSLR for your flash photography. 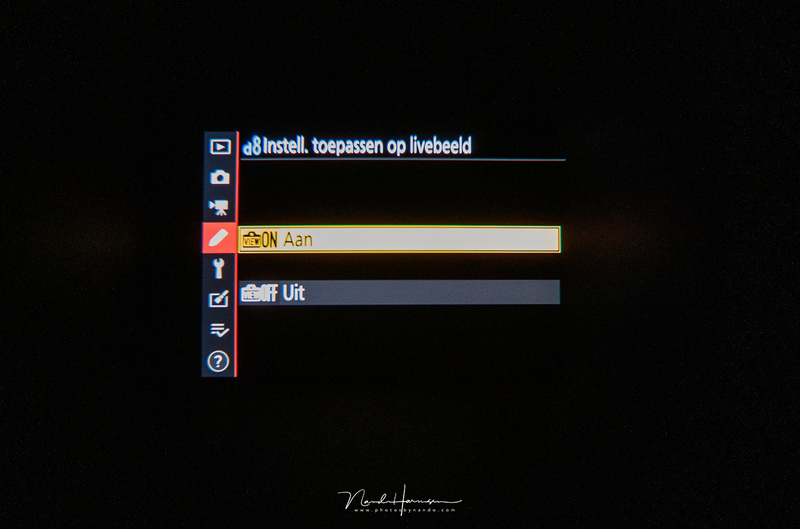 The exposure simulation setting on a Nikon Z7, in the Dutch language. You need to dive into the menu to find it so it might be convenient to make this option more accessible through the [i] menu or in the My Menu tab. After the exposure simulation is turned off, you can see the thing you are photographing again. But be aware, with this setting a wrong exposure won't be visible in the EVF anymore. Changing this setting requires to dive into the menu, or perhaps you can program this setting into a quick menu, or assign it to a custom button if possible. You can also program one of the three custom settings on the PSAM wheel, called [C1], [C2] and [C3] on a Canon, [U1], [U2] and [U3] on a Nikon, or simply , and  on Sony, with all the wanted settings for this kind of flash photography. For those switch a lot between flash photography and photography with natural light, it can be helpful to use one of the custom settings on a camera for flash photography. On the Nikon it is called [U1], [U2] and [U3]. Other cameras may have other names for that. Every camera is different and acts accordingly. I noticed the ability of setting exposure simulation at [M] separately from the [P], [S] and [A] on a Hasselblad X1D-50c. On the Canon EOS R there is a measurement timer in the menu allowing the EVF to become brighter for a certain amount of time and making it possible for the AF to focus. You can use this setting to make a composition also but the frame will afterwards become dark again. 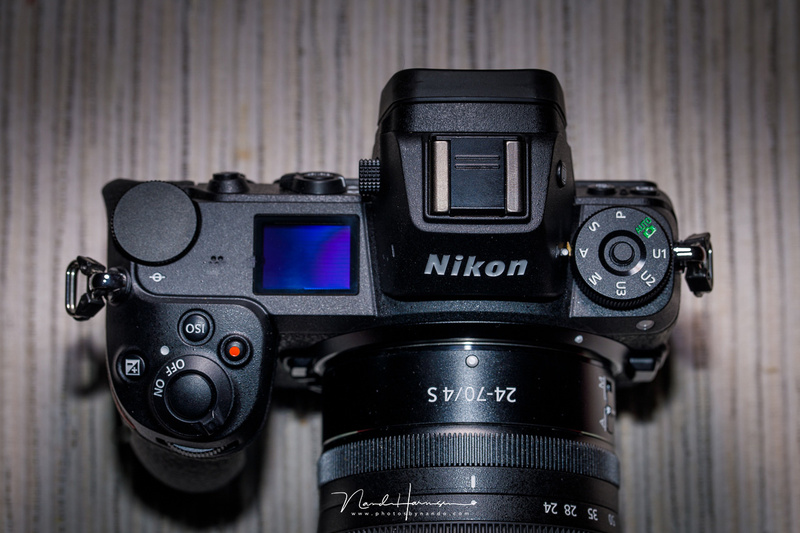 On the Nikon Z7 the AF won’t focus at all, and I haven’t found a solution on that camera. I believe turning off the exposure simulation is the best practical solution. There is a measurement timer on the Canon EOS R that will turn off exposure simulation for a moment to make AF possible. When this timer is set to a longer amount of time, you can use it to make a composition. But after that the EVF becomes dark again. If you blend in flash light with ambient light the view finder will stay usable with exposure simulation and this setting may not effect you at all. Unless you want to underexpose the ambient light of course. In that case the EVF will become darker proportionally. It it becomes too dark — which is funnily enough also influenced by the amount of ambient light — you might want to turn off exposure also. So, when you use flash with a mirrorless camera, and the view finder is so dark you cannot use it, this setting may come to your rescue. Assign a button and you’re good. Have you assigned a custom setting for flash exposure? Or do you have another EVF solution for using flash with flash sync on a mirrorless camera? Let me know below in the comments. 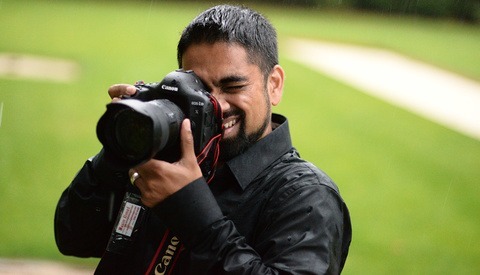 Nando Harmsen is a Dutch photographer that is specialized in wedding and landscape photography. With his roots in the analog photo age he gained an extensive knowledge about photography techniques and equipment, and shares this through his personal blog and many workshops. Another mirrorless tip - for the Sony A7 series (and assuming all mirrorless cameras) if you have silent shutter enabled, the mechanical shutter will not activate, hence it will not trigger any pocketwizards. Very interesting read, thank you for this. It took me some time to realize this on my Fuji as it started seriously bothering me. I first had to understand what was going on and then find the solution: screen configuration-exposure (white balance and manual mode) - No (off). Et voilà, you're set to preview your flash exposure. I did not check my Fujifilm X100t because I always use the optical viewfinder instead of the EVF. Thanks for adding this piece of information. One more thing after your studio shoot, remember to set it back. Without that next time you shooting outside and with changes to aperture and/or ss won't show up in the EVF and you will be going what? That would be my next article.. "Remember to Turn Exposure Simulation on Again"
But you are correct. That is why assigning it to one of the custom dial settings will avoid that. I should have added that. I'm old school. I have an Olympus E-M10 Mk II that has an "OVF" emulator for the eyepiece, and that it's on all the time. I wish I could also do it for the rear screen as well. I don't need to see what my settings are going to do. Very good article! To me it is sad that so few supposed photographers read their manuals and rely on posts like this to understand their cameras. I put all of my camera, lens, flash, and accessory manuals on my phone as PDF files, so I always have them with me. Better than printed manuals IMO. I have done that also, well... some manuals. But I still prefer a book. I use the Flashpoint 600 TTL and when I turn on the transmitter, it automatically disables exposure simulation on the a7riii - so when I want to set ambient, I turn off the transmitter and then click it back on and go... then there's no forgetting either way if I went to natural light for example. That is great, when that happens. I did not experienced that with my flashgun on that camera. Perhaps a setting on the camera? On the Sony A7RIII the setting is located in the Menu: Camera 2: page 7 (Live View Display : Setting Effect ON/OFF). A good option is to set a Custom button to allow you to toggle the Live View exposure simulation on/off. I use the AEL button as a Custom, gives some peace of mind if the flash transmitter doesn't automatically disable the Live View exposure effect to OFF. Okay, I understand there is no dedicated setting for disabling Exp. Sim. for flash. I would note that Panasonic cameras automatically disable exposure simulation when a flash or trigger is in the hotshoe and switched on. Very useful. On a different note, I shoot with a Canon EOS R and use exposure simulation with flash. One issue is that in low light the exposure simulation is not as accurate as in brighter light. I found that in a room with bright recessed lights creating hot spots on people, the ES was not very good at previewing the final result of the ambient exposure. Not a deal killer but a pain to work around. I wish all camera brands would disable Exp Sim when attaching a flash gun. I reviewed my share of ML cameras. The best EVF I have seen is that of the Leica SL, closely followed by the EOS R and third in line the Nikon Z7. 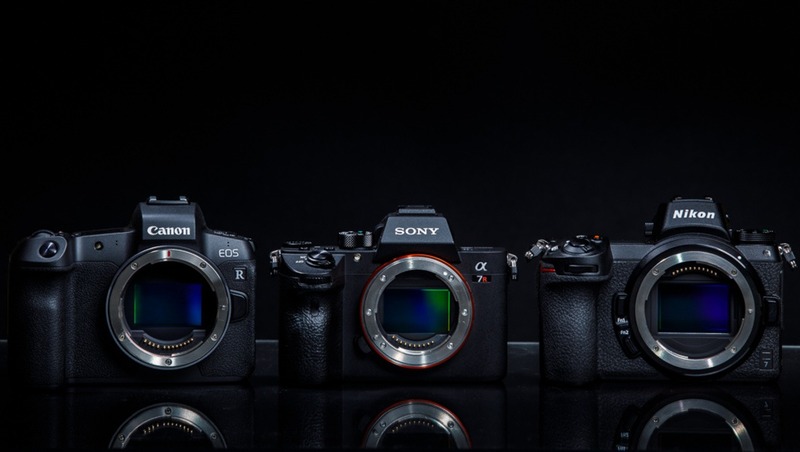 The worst I have seen is the Sony (A9, A7R II and A7R III) The Hasselblad X1D and the Fujifilm X100t, XT-1, X-Pro 2 and GFX don't live up to the expectations also. Sony (at least A7ii and A7iii) automatically turns off simulated EVF when putting a trigger or flash in the hotshoe. So not a problem for Sony users. However, one thing that I found very useful is to assign one of the custom keys to toggle the simulated EVF on, i.e. I can really quick see what the ambient light looks like. That is good news for Sony users. Wish other manufacturers programmed their cameras also like this. This is a big one, and it appears not to be well known: continuous autofocus (AF-C) will stop down the lens on several brands of mirrorless. If you're not shooting wide open, and struggling with focus (hello all you wireless flash users), switch to AF-S, or get model lights. Bonus Tip: Hot shoe mounted LED video lights make great model lights on umbrella brackets with multiple cold shoes. I used to use YN-216 lights with NP-F930 batteries (they will run all day) before switching to AD200 and AD600 lights (the AD-B2 adds model lights for AD200s).